This article is about the American running back. For other people with the same name, see Ron Johnson (disambiguation). Johnson rushed for 270 yards against Navy in 1967. Ronald Adolphis Johnson (born October 17, 1947) is a former American football running back. Johnson played college football at the halfback position for the University of Michigan from 1966 to 1968. He set a Michigan school record in 1967 by rushing for 270 yards in a game. In 1968, he became the first African-American to serve as the captain of a Michigan football team. He set an NCAA record by rushing for 347 yards in a game and set Big Ten records with 92 points scored and 1,017 rushing yards in seven conference games. He also set a Michigan records with 2,524 career rushing yards, 19 rushing touchdowns in a season, and 139.1 rushing yards per game in 1968. He played seven seasons in the National Football League (NFL) from 1969 to 1975 and became the first player in New York Giants history to rush for 1,000 yards in a season, accomplishing the feat in both 1970 and 1972. He also led the NFL in rushing attempts in both 1970 and 1972. Johnson retired as a player in 1976, was inducted into the College Football Hall of Fame in 1992, and became chairman of the National Football Foundation in 2006. He was diagnosed with Alzheimer's disease in 2008. Johnson was born in Detroit, Michigan, in 1947. His father, Arthur Johnson, had a fourth-grade education, but supported his four children working as a trucker. Ron's older brother, Alex Johnson, was a star baseball and football player at Northwestern High School, but opted to play baseball and made his Major League Baseball debut in July 1964 when Ron was 16 years old. Ron followed Alex to Northwestern High School, becoming a star baseball and football player and graduating in 1965. Johnson enrolled at the University of Michigan in the fall of 1965 and played college football for the Michigan Wolverines football team from 1966 to 1968 under head coach Bump Elliott. As a sophomore in 1966, Johnson gained 44 yards on 12 carries, seeing limited playing time in a backfield that included seniors Carl Ward and Jim Detwiler. 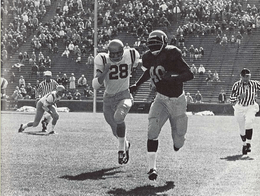 As a junior in 1967, Johnson became the Wolverines starting halfback, gaining 982 rushing yards on 210 carries for an average of 4.7 yards per carry. On October 7, 1967, in his third game as a starter, Johnson eclipsed the Michigan and Big Ten Conference single-game rushing records with 270 rushing yards on 26 carries for an average of 10.4 yards per carry against Navy. He also had 100-yard games that same year against Michigan State (107 yards on 24 carries), Minnesota (108 yards on 17 carries), and 167 yards against Northwestern (167 yards on a career-high 42 carries). He set a Big Ten record with his 42 carries against Northwestern, and he was selected as the most valuable player on the 1967 Michigan Wolverines football team. As a senior, Johnson was captain of the 1968 Michigan Wolverines football team, the first African-American player to receive the honor at Michigan. Johnson led the 1968 team, originally predicted to be an "also-ran" in the Big Ten, to an 8-2 record and a No. 12 ranking in the final AP Poll. He rushed for 1,391 yards on 255 carries in 10 games during the 1968 season. In the second game of the 1968 season, Johnson tallied his second 200-yard game, rushing for 189 yards in the first half alone, and finishing with 205 yards on 31 carries against Duke. He followed with three consecutive 100-yard games against Navy (121 yards on 22 carries) Michigan State (152 yards on 19 carries), and Indiana (163 yards on 34 carries). On November 16, 1968, in his next-to-last game for Michigan, Johnson set an NCAA record by rushing for 347 yards on 31 carries (11.2 yards per carry) against Wisconsin. He also scored a Big Ten record five rushing touchdowns in Michigan's 34-9 victory over the Badgers. The Chicago Tribune hailed Johnson's performance against Wisconsin as "the most explosive display of running in the proud history of the Big Ten conference." His 347 rushing yards remains a Michigan single-game rushing record. Johnson also set several career and season records at Michigan. His 2,524 rushing yards set a new career rushing record at Michigan, eclipsing the record set by Tom Harmon from 1938 to 1940. He also set Big Ten single-season records with 92 points scored and 1,017 rushing yards in seven conference games during the 1968 season. During the 1968 season, Johnson also set Michigan single-season records with 19 rushing touchdowns (breaking a record set by Tom Harmon in 1940), 139.1 rushing yards per game, and 1,557 combined rushing/receiving yards. Michigan head coach Bump Elliott credited Johnson's success to his instincts: "I just think it's instinct. He's a strong runner and has great instincts." Ohio State assistant coach Esco Sarkkinen credited Johnson's physique: "Johnson has good size, speed, agility and balance. But his extraordinary physique give him the ability to shake off tacklers." Johnson himself credited his ability to find an opening as his main asset: "Picking the hole is what I think I do best. It's more instinct than anything else. You either have it or you don't. When the play is called in the huddle I start thinking about where the hole is supposed to be." He was selected by the Football Writers Association of America and Football News as a first-team running back on the 1968 College Football All-America Team. He was also selected as a second-team All-American by the AP, UPI, and NEA. He was unanimously selected by his Michigan team mates as the team's most valuable player, winning the honor for the second consecutive year. He won the Chicago Tribune Silver Football trophy as the most valuable player in the Big Ten Conference. He received the Big Ten Medal as the most outstanding scholar-athlete at the University of Michigan. He finished sixth in the voting for the 1968 Heisman Trophy with 12 first-place votes and 158 total points. Johnson graduated from the University of Michigan in 1969 with a business degree. Johnson was selected the Cleveland Browns in the first round of the 1969 NFL Draft. In August 1969, Johnson ended a lengthy holdout, signing a two-year contract with the Browns in exchange for a compensation package reported to be in excess pf $100,000. In a disappointing rookie season, he appeared in all 14 games, 13 as a starter, as a fullback for the Browns, but gained only 472 yards and scored seven touchdowns on 138 carries. In February 1970, Johnson was traded by the Browns to the New York Giants as part of a multi-player deal that sent Homer Jones to the Browns and Paul Warfield to the Miami Dolphins. Johnson noted at the time that he was "shocked" by the trade, but hopeful since he believed he was better suited to being a halfback than a fullback as he was used in Cleveland. In his first season in New York, Johnson became the first player in Giants franchise history to rush for 1,000 yards. On November 8, 1970, he rushed for 136 yards and caught four passes for 59 yards, including a game-winning touchdown pass with three minutes remaining, in a 23-20 victory over the Dallas Cowboys. He led the NFL with 263 carries and gained 1,027 yards, second in the NFL behind Larry Brown. He also gained 487 receiving yards on 48 catches. Late in the 1970 season, Giants quarterback Fran Tarkenton said of Johnson: "Johnson is the best halfback in football today ... period! He's just a devastating football player." Johnson's 1,000-yard season capped a big year for the Johnson family, as brother Alex won the American League batting title with a .329 average for the California Angels. In the summer of 1971, Johnson suffered a thigh injury while playing a pickup basketball game in Ann Arbor, Michigan. After blood collected in his thigh tissue, Johnson was required to undergo surgery. As a result of the injury, Johnson missed the first six games of the 1971 NFL season. He returned to the lineup for two games, but he sustained a ligament injury against the San Diego Chargers on November 7, 1971, and missed the remainder of the season. Johnson gained 156 yards on 32 carries in two games during the 1971 season. Johnson returned to his pre-injury form during the 1972 NFL season. He led the NFL with a career-high 298 carries and gained 1,182 rushing yards, third best in the NFL behind O. J. Simpson and Larry Brown. He also gained 451 receiving yards on 45 catches. Johnson's two 1-000-yard seasons were also the only two winning seasons the Giants had between 1964 and 1980. Johnson continued to play for the Giants through the 1975 season. He tallied 902 rushing yards and 377 receiving yards in 1973, but saw his playing time drop off in 1974 and 1975. In June 1976, Johnson signed a contract to play for the Dallas Cowboys, but he did not appear in any regular season games for the Cowboys. In 1970, Johnson married his wife, Karen, and they have two children, Christopher and Allison. In approximately 1983, Johnson started Rackson, a food service company based in Totowa, New Jersey. His son, Christoper, later joined the company which eventually owned 13 Kentucky Fried Chicken franchises in Michigan and New Jersey. Johnson was inducted into the College Football Hall of Fame in 1992. In 2006, he was named the chairman of the National Football Foundation, operator of the College Football Hall of Fame, becoming the fifth chairman in 59 years. In 2008, Johnson was diagnosed with Alzheimer's disease. As of 2011, Johnson was living in a residential care facility in New Jersey, and the majority of the cost of his care was being funded by the NFL's "88 Plan". 1 2 3 4 5 6 7 8 "Ron Johnson". Pro-Football-Reference.com. Sports Reference LLC. Retrieved March 7, 2015. ↑ "Ron Johnson Key Factor Behind Johnson's Success". Schenectady Gazette (AP story). November 10, 1970. p. 33. 1 2 3 4 "Ron Runs as Dad Looks On". The Spartanburg Herald (AP story). November 10, 1970. p. 12. 1 2 "Alex Johnson Statistics and History". Baseball-Reference.com. Sports Reference LLC. Retrieved March 8, 2015. 1 2 3 4 Robert Markus (October 12, 1968). "Johnson Unmoved by Little Fanfare". Chicago Tribune. 1 2 3 4 5 6 "Michigan Football Statistic Archive Query Page". Regents of the University of Michigan. 2003. Retrieved 2007-12-06. ↑ Bill Halls (October 9, 1967). "M's Johnson 'Terrific' in 26-21 Loss to Navy". The Owosso Argus-Press (AP story). p. 14. ↑ "1967 Football Team". University of Michigan, Bentley Historical Library. Retrieved March 9, 2015. 1 2 3 "Johnson Wins Player Award: Michigan Names Him Most Valuable". Chicago Tribune. November 29, 1968. ↑ "1968 Football Team". University of Michigan, Bentley Historical Library. Retrieved March 9, 2015. ↑ "Michigan, Johnson Beat Duke". Chicago Tribune. September 29, 1968. ↑ "Big Michigan Salvos Sink Navy, 32 to 9". Chicago Tribune. October 6, 1968. ↑ "Wolverines Win: Upset M.S.U. On Drives In Fourth Quarter". Chicago Tribune. October 13, 1968. 1 2 George Langford (November 17, 1968). "Ohio, Michigan Win; Meet on Saturday; Johnson Gets 347 Yards, Scores Five Times To Help Michigan Beat Wisconsin 34 to 9". Chicago Tribune. ↑ Oliver E. Kuechle (November 18, 1968). "Wisconsin Defeat Summed Up in but 2 Words -- Ron Johnson". The Milwaukee Journal. pp. 2–12. ↑ "Johnson, Brown Big Ten Leaders". The Owosso Argus-Press (AP story). November 29, 1968. p. 19. 1 2 3 "Former Wolverine Johnson inducted into collegiate Hall". The Michigan Daily. January 17, 1992. p. 12. 1 2 "Michigan's Ron Johnson On-and-Off Field Threat". Schenectady Gazette. November 21, 1968. p. 50. ↑ Ted Gangi (ed.). "FWAA All-America Since 1944: The All-Time Team" (PDF). Retrieved February 8, 2015. ↑ "1968 All-America". The Progress (PA). December 5, 1968. p. 17. ↑ "UPI All-America Football Squad". The Ogden Standard-Examiner. November 26, 1968. p. 8. ↑ "NEA All-American". Hope Star. November 30, 1968. p. 6. ↑ "Past Silver Football winners". Chicago Tribune. Retrieved March 9, 2015. ↑ "Ron Johnson Member Biography". National Football Foundation. Retrieved March 7, 2015. ↑ "Simpson Wins Heisman Race; Keyes Is Second". Chicago Tribune. November 27, 1968. ↑ "Ron Johnson's signing Price exceeds $100,000". The Bryan Times. August 7, 1968. p. 11. 1 2 Jack Hand (February 9, 1970). "Ron Johnson Shocked But Happy After Swap". The Owosso Argus-Press (AP story). ↑ "Giants Tip Cowboys; Ron Johnson Is Star". The Milwaukee Journal. November 9, 1970. pp. 2–14. ↑ "More troubles for Giants: Ron Johnson sidelined". Cape Girardeau Southeast Missourian. August 25, 1971. p. 27. ↑ "Ron Johnson Back on Giants List of Injured". The Morning Record. November 9, 1971. ↑ "New York Giants Franchise Encyclopedia". Pro-Football-Reference.com. Sports Reference LLC. Retrieved March 8, 2015. ↑ "Cowboys Sign RB Ron Johnson". Lakeland Ledger. June 24, 1976. p. 1B. 1 2 3 Rhoden, William C. (September 18, 2011). "Ex-Giant' s Case Is a Window on N.F.L. Aid". The New York Times. Retrieved March 7, 2014. ↑ "Running for Ron: Son of Former Giants RB runs for Dad". New York Giants. October 25, 2012. ↑ "Chris Johnson, son of former Giant Ron Johnson, running marathons to raise money for father's illness". NorthJersey.com. November 11, 2012. ↑ "Ron Johnson Succeeds Jon Hanson as NFF Chairman". National Football Foundation. April 18, 2006.